On August 15, 2017, Insilico Medicine, Inc, a Baltimore-based next-generation artificial intelligence (AI) company today announced a research collaboration with The Bitfury Group, the world's leading full-service blockchain technology conglomerate, to develop novel solutions for healthcare applications. The companies signed a memorandum of understanding (MOU) to collaborate in the academic and commercial settings to develop AI on blockchain solutions for the healthcare industry. "Blockchain can secure and streamline our medical systems, while AI has the potential to revitalize data management and machine learning to help identify trends and diseases," said Valery Vavilov, Founder and CEO of The Bitfury Group. "By partnering with Insilico, we will be able to combine their expertise in deep learning and bioinformatics with our blockchain proficiency and real-time solutions to create bespoke and innovative new products for the healthcare sector." "The Bitfury Group is one of the most reputable companies in blockchain, developing their own semiconductors and end-to-end blockchain solutions trusted by the major corporations and governments worldwide. We are happy to enter into a research collaboration with Bitfury to develop innovative solutions that may save lives and extend human healthspan,” said Alex Zhavoroknov, PhD, Founder and CEO of Insilico Medicine, Inc. [Editor’s Note. The following excerpt from an article (http://mitsloan.mit.edu/newsroom/articles/blockchain-explained/) from the MIT Sloan School of Management provides some insight into blockchain technology: Blockchain is a term widely used to represent an entire new suite of technologies. There is substantial confusion around its definition because the technology is early-stage, and can be implemented in many ways depending on the objective. Scientists from Boston Children's Hospital Vascular Biology Program have revealed an engineered fusion protein that could recover blood vessel health following the onset of hypertension, atherosclerosis, stroke, heart attack, and other cardiovascular diseases. The findings were published on August 14, 2017 in Science Signaling. The article is titled “An Engineered S1P Chaperone Attenuates Hypertension and Ischemic Injury.” On average, each person has 60,000 miles of blood vessels coursing through his or her body. There are a number of mechanisms that the body uses to keep its vast vascular network healthy, including a tiny fat molecule, a lipid called S1P, that plays a particularly important role. S1P receptors dot the surface of the endothelium, a layer of cells that line the inside of all the body's blood cells. 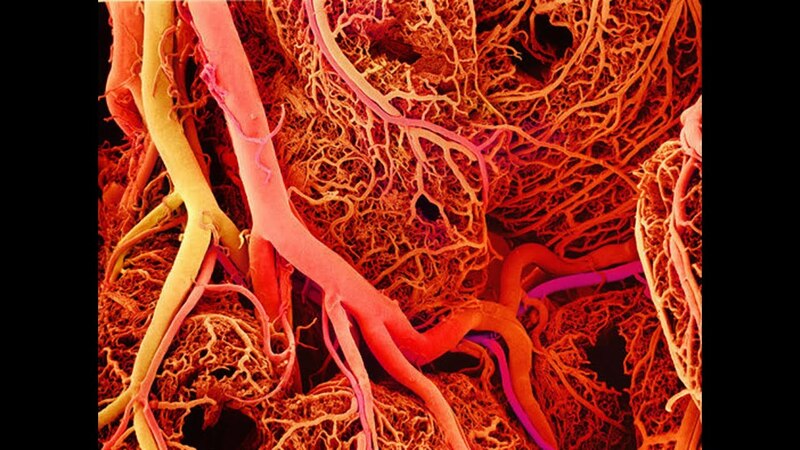 Together, these so-called endothelial cells form a barrier between the body's circulating blood and surrounding tissue. When S1P molecules activate their receptors, that suppresses endothelial inflammation and generally helps regulate cardiovascular health. Now, researchers led by Timothy Hla, PhD, from the Boston Children's Vascular Biology Program, have designed a novel therapeutic fusion that could trigger increased S1P receptor activity and recover blood vessel health following the onset of a range of cardiovascular diseases. As crucial as S1P is to our health, it cannot do its job alone. Instead, S1P relies on another set of the body's molecules to ferry it through the bloodstream so that it can find and bind with its cell receptors on the endothelium. "High density cholesterol (HDL) -- also known as good cholesterol -- carries a protein called ApoM, which in turn attracts and binds S1P in its cargo," says Dr. Hla, an investigator in the Vascular Biology Program, Patricia K.
Pancreatic cancer is now the third leading cause of cancer mortality. Its incidence is increasing in parallel with the population increase in obesity, and its five-year survival rate still hovers at just 8 to 9 percent. Research led by Nada Kalaany, PhD, at Boston Children's Hospital and the Broad Institute of MIT and Harvard, now suggests a novel approach to treating this deadly cancer: targeting an enzyme that tumors use to get rid of nitrogen. The study, published online on August 14, 2017 in Nature Communications, provides evidence that targeting the enzyme arginase 2 (ARG2) (image) can curb the growth of pancreatic tumors, especially in people who are obese. The open-access article is titled “Critical Role for Arginase 2 in Obesity-Associated Pancreatic Cancer." The researchers began by introducing human pancreatic tumors into obese and lean mice. They then analyzed what genes the tumors turned on and what metabolic products they were producing. They found that tumors in obese mice had enhanced expression of many genes involved in metabolizing nitrogen, a natural byproduct of cells when proteins are broken down. Until now, how nitrogen excess affects tumor growth has been largely unknown. "We found that highly malignant pancreatic tumors are very dependent on the nitrogen metabolism pathway," says Dr. Kalaany, a researcher in Boston Children's Division of Endocrinology and an Assistant Professor at Harvard Medical School. Pancreatic tumors grew faster in obese mice than in lean mice and produced increased amounts of ARG2, an enzyme that helps dispose of excess nitrogen by breaking down ammonia, as part of the urea cycle. Dr. Many schizophrenic and depressed patients experience weight gain and type 2 diabetes in their quests for the life-changing benefits of a major class of antipsychotic drugs. University of Texas (UT) Southwestern Medical Center researchers identified a cellular receptor central to these undesirable effects. They then eliminated most of these metabolic changes in mice co-treated with a weight-loss drug that targets the serotonin 2c receptor. "Atypical antipsychotics are essential medications for millions of schizophrenia patients worldwide and they are increasingly being prescribed for bipolar disorder, major depressive disorder, and autism," said Dr. Chen Liu, an Assistant Professor of Internal Medicine and Neuroscience and co-corresponding author of an August 14, 2017 Journal of Clinical Investigation study along with Dr. Joel Elmquist, Director of the Division of Hypothalamic Research and a Professor of Internal Medicine, Pharmacology, and Psychiatry. The open-access article is titled “The Atypical Antipsychotic Olanzapine Causes Weight Gain by Targeting Serotonin Receptor 2C.” "Most members of this class of antipsychotics are linked to a drug-induced metabolic syndrome characterized by excessive weight gain, blood fat abnormalities, and type 2 diabetes. Obesity and diabetes often develop shortly after treatment begins," added Dr. Liu, who is also in the Division of Hypothalamic Research. The researchers found that six weeks of exposure to the antipsychotic drug olanzapine caused weight gain - particularly in female mice - due to increased fat rather than muscle. "Similar to treatment in humans, mice given olanzapine showed significant weight gain, higher food intake, and metabolic changes associated with insulin resistance and diabetes," said Dr.